This 2013 Ram 1500 Sport shows off some of the styling changes, including new headlight units, a larger grille, and a reworked front bumper. The emblems on the grille have been redesigned to leave additional space for business logos. 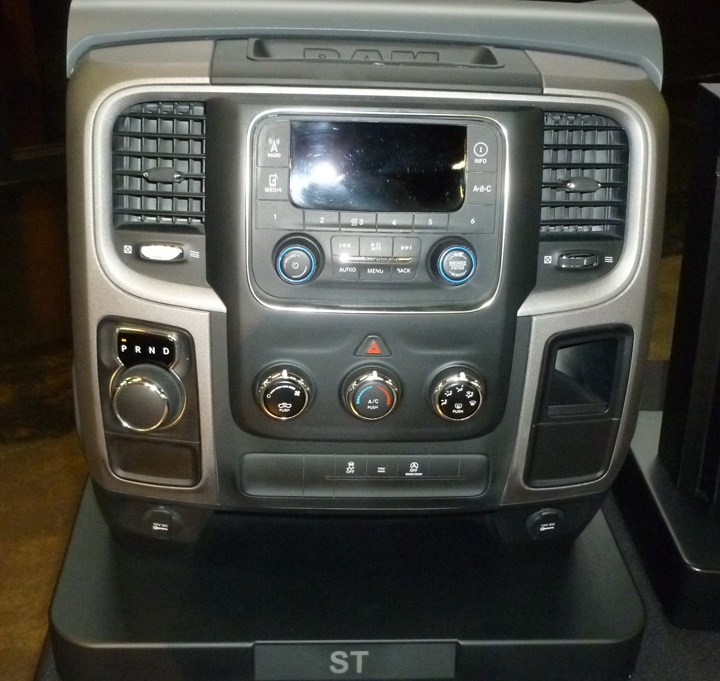 I recently returned home from Nashville, where I attended the press preview of the 2013 Ram 1500 pickups and was able to drive several different variants of the new truck. 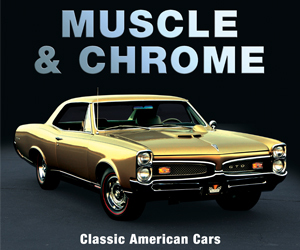 Recent trends have automakers simplifying their car models, many times offering only a single body style in a handful of trim levels. It’s different in light-duty trucks, where variety is still common. 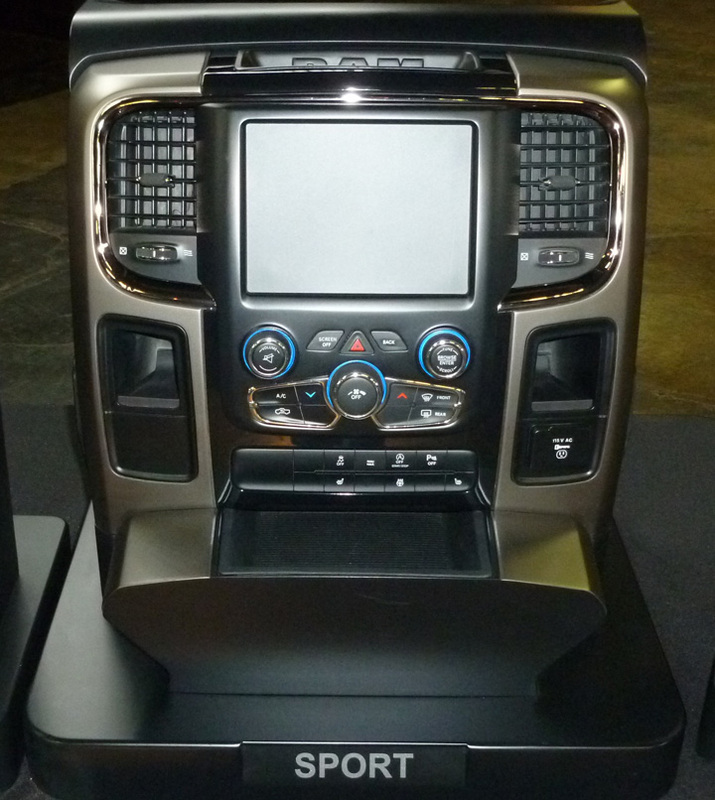 For example, the Ram comes in three different cab styles, and there are three different lengths of beds. Trim levels, and sub-variants of them, are even more prevalent. . . . . . . . . . . . . . . . . . . . . . . . . . . . . . . . . . . . . Interior differences are numerous too. To help demonstrate the trim changes and various controls, Ram officials put individual mocked-up sections of the dashboard’s central control panel—or center stack—on display. Some of the details might differ from production, but the major differences are apparent. Ram 1500’s entry-level model is the fleet-only ST. The Tradesman and Express models are based off the ST and share many of the same interior features. This display shows the base climate control system, along with the rotary control knob (at lower left) for the new “TorqueFlite 8” 8-speed automatic transmission. There are small storage bins above the radio and opposite the rotary shift knob. The next step up the food chain is the SLT. The HFE, Big Horn, Lone Star, and Outdoorsman models are based off the SLT. This mock-up is for a four-wheel-drive truck with the 6-speed automatic. Note the mid-level radio and additional bright-metal trim. Sport models get unique interior trim, along with bucket seats and a center console. 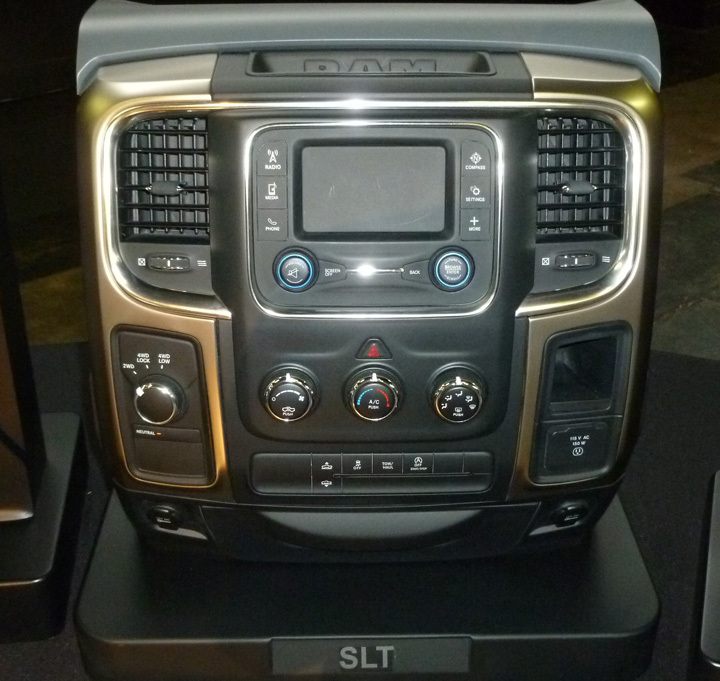 This mock-up is for a rear-drive truck with the 6-speed and a shifter on the console. It has the Uconnect system with the 8.4-inch touchscreen. 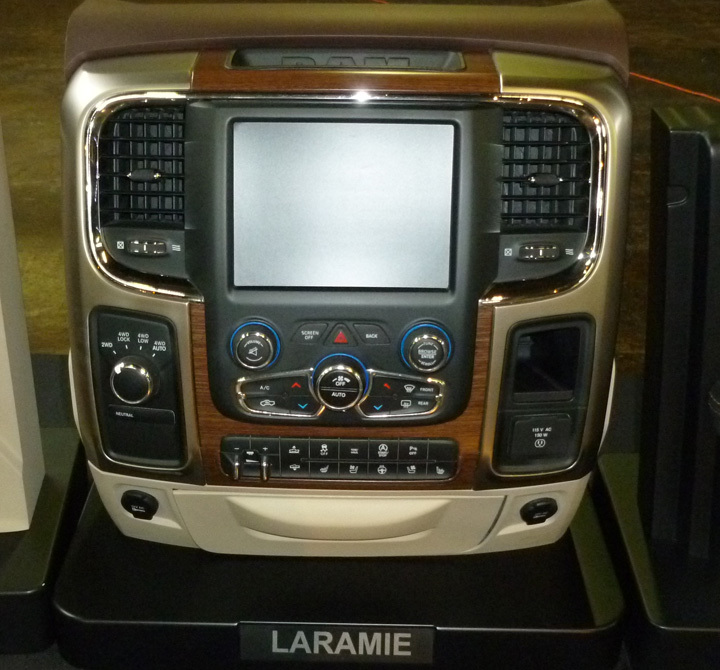 The Laramie has unique trim with simulated woodgrain accents. This mock-up would be for a four-wheel-drive truck with the 6-speed transmission and a column shift. 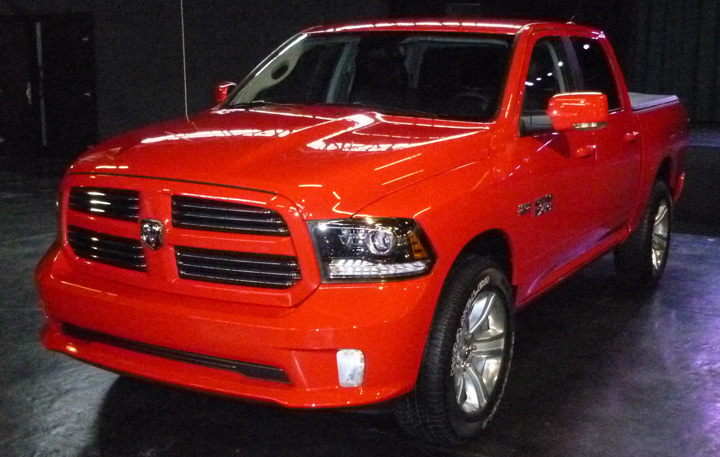 The 2013 Ram 1500’s top trim level is Laramie Longhorn. It has a beautifully finished interior in a western theme. Think lots of leather and “tooled” filigree detailing. For those who want to downplay their inner cowboy, the interior is offered without the filigree trim. 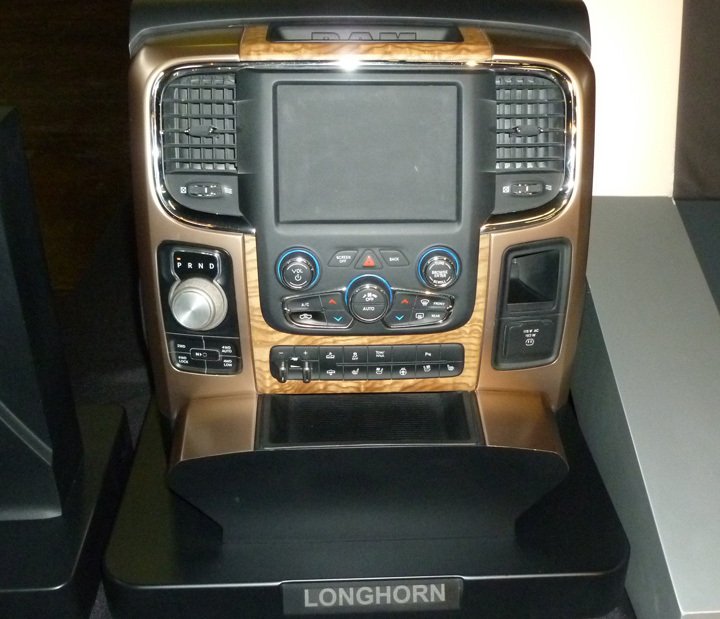 In the Longhorn, the wood trim is real walnut that previously was used in fence posts in France. I’m not sure how Chrysler’s purchasing department tracks down French fence posts, but the wood trim looked great in the Longhorn I drove. This mock-up is for a 4-wheel-drive Longhorn with the 8-speed. It also shows the front section of the console that’s included with the model’s available bucket seats. Written by: Don Sikora II on August 27, 2012.on March 22, 2018.